Add a little Italian flare to your meatless Monday with a vegetarian recipe that takes less than 30 minutes to make. Lycopene-rich cherry tomatoes are roasted with garlic, sugar, and spices to bring a rich, caramelized taste to this pasta dish. Add a little Italian flare to your meatless Monday with a vegetarian recipe that takes less than 30 minutes to make. Lycopene-rich cherry tomatoes are roasted with garlic, sugar, and spices to bring a rich, caramelized taste to this pasta dish. 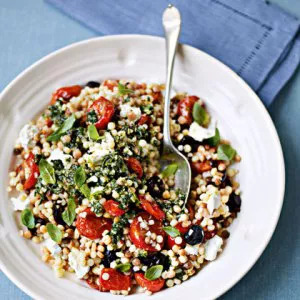 Fregola sarda pasta—similar to Isralei couscous in look and texture—has a nutty flavor that mixes well with the pine nuts, goat cheese, olives, and Parmesan cheese. With all the ingredients together, this meal provides 24% of your daily recommended intake of protein and is just 339 calories. Ingredients: Cherry tomatoes, garlic gloves, sugar, oregano, black pepper, olive oil, fregola sarda pasta, pine nuts, basil, Parmesan cheese, black olives, goat cheese.